Most business processes are dependent on multiple tasks to be performed by different users in an organization. Emails have largely replaced the earlier verbal and post it notes tasking methods. Unfortunately emails, although electronic, still fail to eliminate the drawbacks of the earlier tasking methods –lack of accountability, visibility and traceability. With the plethora of emails we receive every day, it’s very easy to lose track to tasks assigned this way for both the assignor and the assignee of the tasks. Document management software goes a long way in improving collaboration between employees when it comes to sharing data. However, wouldn’t it be nice to manage your document centric tasks right inside of your document management system? Docsvault makes your document centric task management simple with its built-in Document Tasks feature. Certain mundane jobs such as sending invoices to accounts department or forwarding documents and contracts to legal department for review don’t need any expertise. However, a lot of time of an average employee’s day goes in assigning and chasing the status of such repetitive tasks. Docsvault’s built-in task management system allows your employees to work at their full capabilities by taking care of all the routine jobs like sending documents to users for review, approval or comments. Automatic notifications and full visibility of pending tasks ensures tasks are completed in time. Users can even create tasks and reminders for themselves. This means, your organization can get more out of your staff improving performance for all departments. Assign new tasks and route documents to concerned users. Set due date, priority and reminders to ensure timely completion of tasks. You can archive or file your tasks and review them later from under the Filed Tasks list. This ensures you have record of all your tasks and can view them whenever the need arises..
Quickly check any tasks that have been assigned. Avoid bottlenecks in any process that lead to delays. 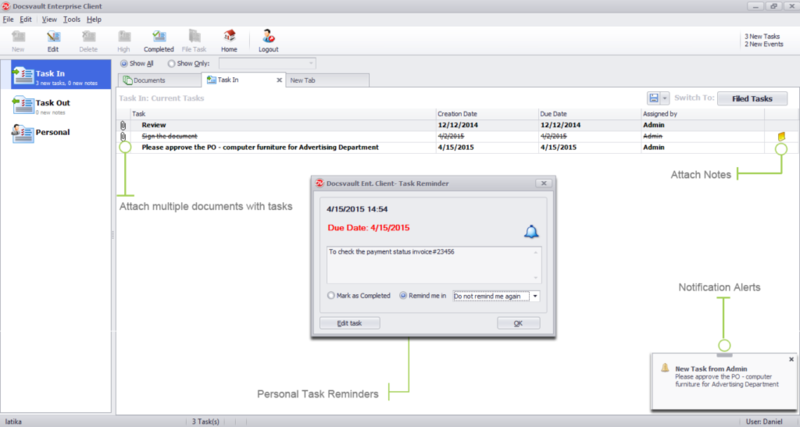 Communicate with other users through task notes and messages attached with tasks. Add emails and attachments from MS Outlook and search for them using full-text search.